The popularity of biogas as a fuel to generate electricity has grown significantly over the last few years, with its usage having doubled since 2013(1). shentongroup remains at the forefront of Combined Heat & Power from Biogas, so when a biogas specialist sought a CHP solution for a large Folkestone-based farm so that it could utilise biogas produced through its own anaerobic digestion facility, it approached shentongroup. 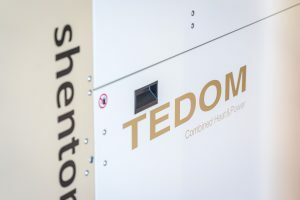 As the sole UK and Ireland distributor of Tedom CHP systems, shentongroup provided a Tedom T200 system. As with all CHP systems, the process of cogeneration provides cheaper electricity with a smaller carbon footprint, thanks to the ecologically-sound nature of biogas; a fuel produced through the process of anaerobic digestion. As the electricity is produced, the heat generated is recovered and utilised for heating the AD process, or for other on-site applications such as hot water for dairy farming, as an example. The Tedom T200 CHP system generates 200kW electricity output, with 322kW thermal output. Electrical efficiency is circa 34.4% and thermal efficiency is around 55.3%, making the total efficiency of the T200 an impressive 89.7%. Since installing and commissioning the T200 unit, the client has conveyed satisfaction with the system, having successfully used it for 21,000 hours so far. The large farm has significantly cut its energy bills, harnessing biogas from its very own biogas production unit, a system remaining popular across the agriculture sector. New developments in this sector include the use of CHP units to cover the base-load electrical demand for Gas-to-Grid schemes. Farmers producing biogas can upgrade to bio-methane standards for injection into the national grid gas network. Therefore, through utilising biogas CHP to produce low-cost electrical energy, farms can save considerable sums of money off their operating expenses. To learn more about harnessing biogas through anaerobic digestion and shentongroup’s range of Tedom CHP systems that generate cheaper, greener energy from biogas, click here to speak to a member of the UK’s leading technical experts in Standby Power, Uninterruptible Power Supplies and Combined Heat & Power Systems.